The Merchant Card is a custom accessory card, they are tradeable and the stat bonuses are stackable. It adds 20 to Strength, and allows use of Mammonite and Loud Exclamation. 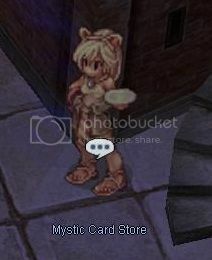 To the Mystic Card Store, who can be found at mystic_shop 118 131. She's pictured below, different area same NPC i promise.